am Juni 14, 2016, 12:52 p.m.
After a long campaign, we are now only a week away from the vote on the UK’s membership of the European Union. Everyday sees fresh fluctuations in the headline poll numbers for Remain or Leave as the public hears the arguments and counter arguments for and against being part of the EU. There are still ten days until results are declared and, as we saw in the Scottish referendum, a lot could change in that time. But are there any clues in the numbers below the surface to indicate which way voters might lean when deciding Britain's European destiny? To answer this we have to go back to the 2015 General Election. Pollsters of all shapes and sizes got the outcome wrong. But had we scratched beneath the surface of our polls the data was there to indicate the coming Conservative victory. How? Well, because while we got the headline voting intention numbers wrong (showing a far closer race between the Conservatives and Labour in terms of voting intention than was actually the case), the non-horserace numbers on leadership, the economy and trust as the top issues of the day gave heavy hints about a Conservative victory. Simply put, if pollsters had asked voters every question except 'who are you going to vote for' we'd have seen a clear preference by voters for David Cameron to stay on as Prime Minister and a belief that Labour could not be trusted with the economy, immigration or welfare. Only on the issue of the NHS did Labour lead the Conservatives and that issue was eclipsed in terms of importance to voters by leadership, the economy and immigration (and sometimes welfare, too). That's why we think it's important now to look beyond the headline figures on Brexit to see past who is ahead or behind by one or two points at the moment to seek out the underlying numbers that may give us a clearer picture as to the public's real thoughts and feelings towards Brexit. To this end we looked at YouGov's data on the major factors and issues that we think are likely to shape the referendum's outcome, namely: the question of risk, the economy, the personal impact of staying or leaving, the idea of control and immigration, and trust in the campaigns' leaders. So let's look at them one by one. Broadly speaking, voters think that leaving is riskier than remaining and, although there seems to have been a decrease in the “riskiness” of getting out of the EU recently, they still think it is far more risky than staying in. In Scotland, Alex Salmond also successfully “talked up” the risk of remaining (namely, the future risks of a Conservative government) which hasn’t really happened in the EU referendum yet. Count 'Risk' as a win for Remain here. But the problem for Remain is, winning on risk may well be a win in abstract terms only, as our numbers on the economy show. 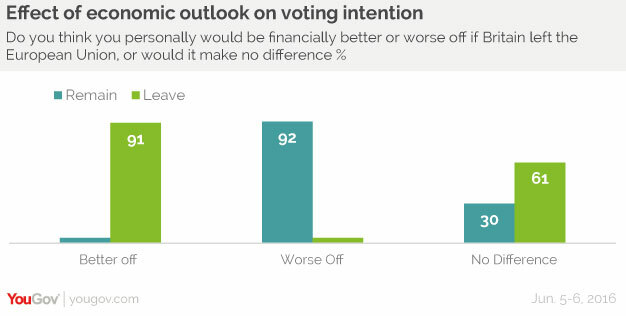 Voters think that the economy will be worse off if we leave the EU but although this has been the trend during the campaign, it hasn’t yet translated into thinking they will be worse off personally. For as YouGov's Laurence Janta-Lipinski has explained, approaching half of voters still think the outcome will make no difference to them economically. Furthermore, as Professor Phil Cowley’s work with YouGov shows, people say they will vote to remain if they believe they will personally be worse off if Britain leaves the EU (even if it’s just £25)...but despite the Remain campaign throwing everything at this, the 'better off in' argument has not connected with voters. This begs the question as to what those who currently say that leaving or remaining would make “no difference” to their household finances will end up voting. At the moment they say they would vote to Leave. This may be because if the economic argument is evenly balanced for these voters other factors become more important to their decision making, such as the desire to have increased control over the country's borders. Thus on the economy, perhaps the most important determinant in voter decision-making, the picture is truly muddled. This explains in large part why Remain has yet to pull into the lead that many had been expecting. Win over people who think it will make no difference to them personally. In all likelihood, Remain will now double down on the former and attempt to persuade voters of the economic downside that will personally impact them should Leave win. But should such an approach fail, the other factors in voter decision-making come to the fore. Namely the idea of control and immigration and trust in the leaders of the two campaigns. We’ve been asking this question “If you HAD to choose one or the other [control of immigration versus the right to trade freely with the EU], which of the following would you prefer?” Here the results show a de facto tie between Remain and Leave - even amongst the all-important swing voters. It should be noted that these numbers have remained broadly unchanged throughout the campaign almost always floating to within a couple of points of 50/50. Finally there is the question of trust in the leaders of the two campaigns. Here again the picture is mixed. Of the four Leave leaders and three Remain leaders we regularly ask about, people trust the Leavers more, although this effect disappears entirely if you remove Boris Johnson. The effect also disappears amongst swing voters who distinctly prefer David Cameron to Nigel Farage. 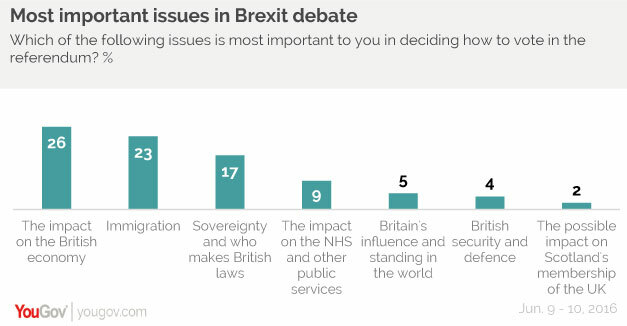 So if this were all the information we had, we may well be inclined to say that Leave have the advantage because Remain's risk and economy arguments haven't hit home and voters generally think that controlling immigration is as important as being in the single market. What's more, for all the power and majesty of government, Remain's leaders score similarly on trust as those heading the Leave campaign. But we should also remember that, unlike last year's general election where the top factors and issues polling produced clear leads for the Conservatives over Labour in four out of five measures, the Brexit picture is far more mixed. In essence, a series of ties means Leave have neutralized Remain's chief advantages whilst also elevating their own preferred ground of immigration to the same level of importance as access to the single market. Remain is winning the argument on the likely negative impact leaving would have on the national economy but their argument has not cut through for voters in terms of their own personal situations. So for Leave to win, they need to maintain the status quo of de facto draws across these indicators. For Remain to win, they need to cut through on the personal level with their economic argument and/or make up ground on immigration. Following these numbers over the final ten days is likely to be more illuminating as to the result than just tracking the headline horserace numbers of who's ahead and who's behind. But these figures only tell us what the public are thinking now. As we saw in Scotland, a lot can change in ten days.